BMW Announces the New 2016 MINI Convertible | Atlantic Autowerks Ltd. 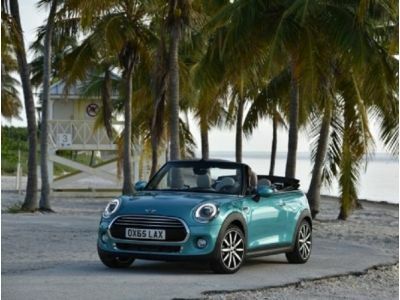 Earlier this month, BMW released the first images and specifications of the upcoming MINI Convertible. Scheduled for release next March, the convertible will be available in the Cooper and Cooper S models and will be powered by the same performance-driven engine found in the company's other front-wheel drive vehicles. Larger than previous MINI Convertibles, the new model is 4.5 inches longer and 1.7 inches wider. With a wider wheelbase and a roomier interior, the new convertible is sure to be a hit with people looking for the benefits of a compact car without requiring them to sacrifice storage space or passenger comfort. Using the same C-pillars as previous models, the MINI Convertible's fabric top can be opened at up to 18 miles per hour and features two spring-activated bars that automatically lock into place in the case of rollovers. Drivers who have become accustomed to the MINI Cooper's responsiveness, quick acceleration and handling will no doubt be right at home behind the wheel of the new convertible models. Fitted with a 1.5-liter turbocharged engine with 134 horsepower, the Cooper model promises to offer the same fun, feisty performance as its hard-top cousin. In addition to this, the Cooper S model will offer an improved 2.0-liter engine with 189 horsepower to anyone looking for a little added oomph. While pricing hasn't yet been announced, Atlantic Autowerks is anxious for these new MINI Coopers to start rolling into our shop. Offering a range of MINI Cooper maintenance services, from oil filter replacement and tire rotation to hydraulic brake flushes and body inspections, we look forward to getting our hands on this new generation of MINIs. Whether you're a current MINI owner or planning to pull the trigger on this year's latest models, be sure to drop by our shop and learn how we can help you keep your vehicle in peak condition.